I am combining two things with this one photo today. The April Challenge has been going all April and I have wanted to go back and take this photo for the challenge. Well it just so happens that today’s theme for Photo Hunters was Unique/Funny Signs. 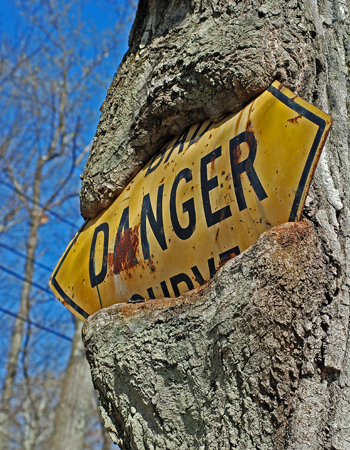 I find this sign to be pretty unique and quite funny as the sign is slowly being ‘eaten’ by the tree. It is such an interesting sign. I took a different photo of this about a year ago for Photo-A-Day, this one is from a different angle and I took it today so I figure it should count. Loved this funny photo! I’ve seen trees eat a chain or rope but never a sign before. Good Post!! Funny you should say that. One of my April Challenge photos is of a tree eating a chain link fence. That was a pretty cool one too. IF you want to, check out my flickr account for my April Challenge set to see it. It is pretty bizarre. But also very cool. I think you are correct. LOL.